Understanding each of your 7 module abilities is crucial for mission success. Below are descriptions of each module, along with tips and tricks. Add a five or higher to activate NO MOVEMENT DAMAGE. 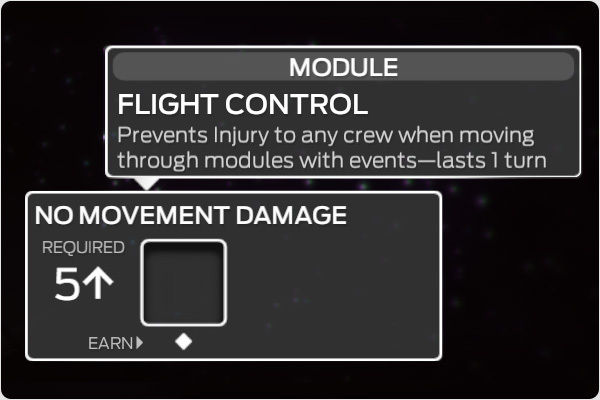 Drop a 5 or higher into the module and you will be able to pass through events without injury to your character. This comes in very handy when you need to get to another module, or if you need to get the best possible character to an event. This room can also free up your characters' movement to get them to Flight Control on your final turn. A pair will get you one food, three of a kind gets you two. Ultimately, the Greenhouse is more about the psychological benefits of tending to a slice of earth. That being said, it does provide small portions of food when module ability is performed. You will need a matching pair of dice added to the module ability to receive 1 food or three of a kind to get 2 food. Add any die to regain two dice, a pair gets you four. The center of the ship, Life Support is a powerful room. Add any die to this module to get 2 dice in return, make a pair and you will have 4 dice on your next turn. Add a five or higher to reduces stress. The long voyage to Mars can get lonely. Being able to contact Earth and correspond with your friends and family helps take the edge off. A 5 or higher in this module will reduce stress. High stress will drastically affect the choices presented to you by the crew during the Side Project phase. A character with low stress will suggest options with a better outcome. High stress options can even make a character suicidal. Add a five or higher to recover all health. In extreme cases, the Medbay can act as a morgue. It's also where the only toilet is. This module can restore your health to full, If all systems are operational. Add a five or higher to receive three assist. 5 or higher will get you 3 extra Assists. Being able to block Hazard dice with an Assist will get you out of sticky situations. For example, if you have an Event with a 5 Injury and a 2 Void and you roll 2 fives, you will get 2 Injury to your character. If you had an Assist, it would block the Injury and you would live to tell the tale. Two of a kind gets you two ship, three of a kind gets you three. When you need to repair your Ship, do so here. Adding a pair will get you 2 "Ship" and 3 of a kind will get you a total of 3 Ship. If you run out of Ship you die. It's a good idea to keep a character near or in this module. Each Character has a "Class Ability." When used correctly, they can be extremely beneficial with both short and long-term rewards. Knowing when and where to use these traits greatly increases your odds of getting to Mars. Use Kayla last to heal as many members of the crew in a module as possible. Pavel can get you an extra "Ship." He is the only one keeping the ship from falling apart. The Captain can get more out of his crew by inspiring them when in the same module. A rolling stone gathers no moss - stress reduction is a must for the crew. A commander keeps informed on the situation at all times. +4 repair. The ability to pass through events unharmed gives you free rein of the ship. An expert in the practical application of science. Joy can help block hazards. "I like my meat raw!" There are 27 different Research cards that can be used throughout the game. These cards can do anything, from a quick fix to offering major assistance. To research a Project, add dice to the "Research Projects" holder. Each die, no matter what the denomination, gives you 1 point. The maximum research points you can have is 6. To activate a card, simply click the card. When it pops up, click "USE". The events on the ship fall within three categories: Easy, Medium and Hard. On each turn, a set number of events are dealt out to a location on the ship. Some turns will have no Hard events, and some will have multiple, for example. The events within each difficulty category are balanced against each other so that Hard events are about equal. Sometimes those events will require more work and have fewer hazard dice, while other times events have very challenging hazards but a lower work value. This system is similar to board games where a player draws from a deck of cards to establish the next enemy or challenge. By breaking up the events into categories we limited the randomness that would result, all the while delivering a unique experience each game. The balancing of each event category and number of events that appear was one of our topmost concerns. While the game may be challenging, we have found it is the most strategic and memorable when you are in over your head. "Earth's first Mars mission should have been 300 days to glory. Yuri only made it to 170, and we lost Allison after 105. Defy the odds, Make the difficult decisions, and embark on the most important rescue mission in the history of mankind."